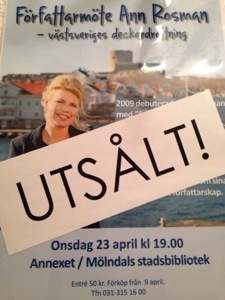 Returning home after a fine evening at Mölndal library. Using aspirin, cough medicine, and support from the audience walked the road. I have the nicest readers! Thank you to everyone who came! And so we managed to get a few items of catfish delivered directly from the printers. (Released otherwise May 5) So now I sit and knock the book. Some are available on the Akademibokhandeln in Mölndal. It really is the best feeling to sit and sign a new book! Now I will try to cure his voice for tomorrow awaits loading for the word to the audio book.